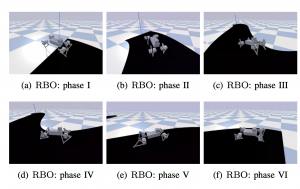 A new paper by Google Robotics using PyBullet. Interest in derivative-free optimization (DFO) and “evolutionary strategies” (ES) has recently surged in the Reinforcement Learning (RL) community, with growing evidence that they match state of the art methods for policy optimization tasks. However, blackbox DFO methods suffer from high sampling complexity since they require a substantial number of policy rollouts for reliable updates. They can also be very sensitive to noise in the rewards, actuators or the dynamics of the environment. In this paper we propose to replace the standard ES derivative-free paradigm for RL based on simple reward-weighted averaged random perturbations for policy updates, that has recently become a subject of voluminous research, by an algorithm where gradients of blackbox RL functions are estimated via regularized regression methods. In particular, we propose to use L1/L2 regularized regression-based gradient estimation to exploit sparsity and smoothness, as well as LP decoding techniques for handling adversarial stochastic and deterministic noise. Our methods can be naturally aligned with sliding trust region techniques for efficient samples reuse to further reduce sampling complexity. This is not the case for standard ES methods requiring independent sampling in each epoch. We show that our algorithms can be applied in locomotion tasks, where training is conducted in the presence of substantial noise, e.g. for learning in sim transferable stable walking behaviors for quadruped robots or training quadrupeds how to follow a path. We further demonstrate our methods on several OpenAI Gym Mujoco RL tasks. We manage to train effective policies even if up to 25% of all measurements are arbitrarily corrupted, where standard ES methods produce sub-optimal policies or do not manage to learn at all. Our empirical results are backed by theoretical guarantees.